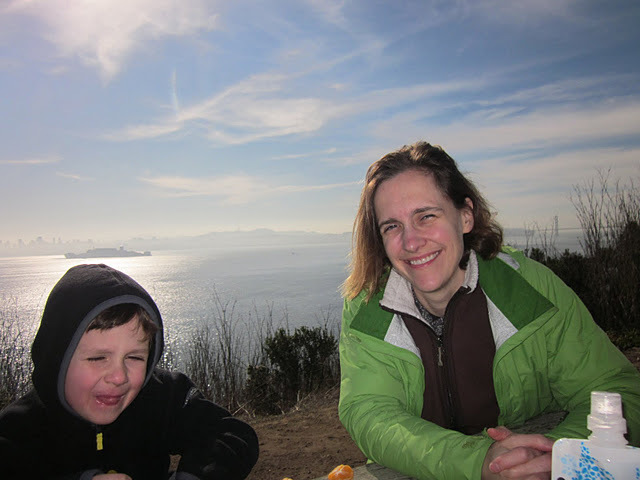 While our kids were out of school over winter break we took the ferry to Angel Island. This is one of those trips that never would have seemed feasible before bicycles. There are no cars allowed on the island (other than those of the staff and summer trams) and the island is too large and the stay too long for it to be reasonable to walk with the kids; they would barely have made it past the docks on foot, and then we would have had another four hours before the ferry returned. After going on our bicycles I’d say that it was a mixed success. Matt and I had fun but even though we did the hauling, the kids got tired and frustrated and cold. By the middle of the afternoon they were engaged in their usual protest strategy of spending a half-hour in the bathroom apiece because they didn’t want to go anywhere anymore, even though the bathroom in question was a glorified outhouse in the middle of an empty field nowhere near the ferry dock that would get us home. But up until lunch, we all had a good time. 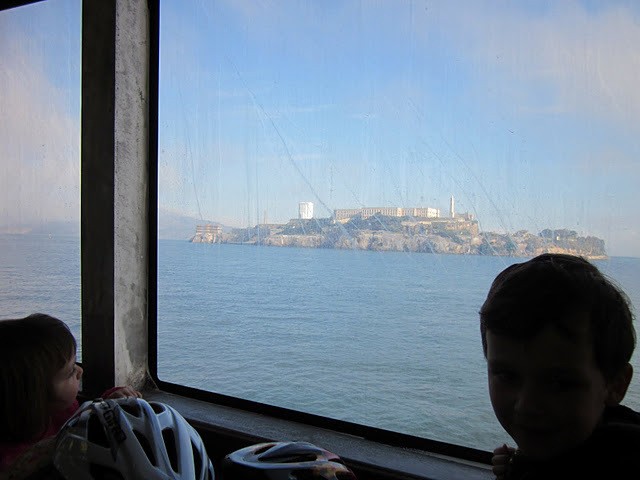 The kids adored the ferry ride, especially spotting the buoys decorated in Christmas colors, and they liked the first half of the bike ride and eating lunch on the top of a hill looking over the old and new Bay Bridges. We rarely get to spend extended time with them outdoors as their default expectation is that after an hour in the park it’s time to go to a café. But in the off-season on Angel Island, there are no cafés. The costs of urban living: they are not fans of the concept of “wilderness,” not even half-hearted wilderness like an island you ride to on a ferry that has flush toilets and that was once the Ellis Island of the West. 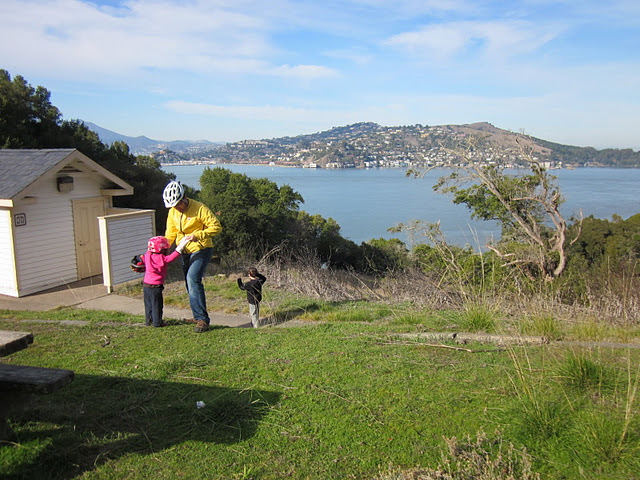 In fact, in winter on Angel Island there’s not much of anything. There were almost no visitors on the ferry with us. Six bikes in total made it onto the island, two ridden by mountain bikers who immediately hit the unpaved fire road, and two ridden by tourists tailed by a walker who’d chosen not to rent a bike for the trip. The first couple outpaced us immediately and we outpaced the second; even with the kids aboard, we ride faster than pedestrians. Everyone else was walking. We barely saw other visitors during our entire loop around the island. It was a startling change from a normal day in the city. Angel Island actually sports some serious hills; the whole route is paved but it’s got elevation galore. None of it exceeded what we see on a daily basis in San Francisco, but none of it was familiar either, and it’s much easier, we’ve found, to climb a hill you know than to climb a hill you don’t. 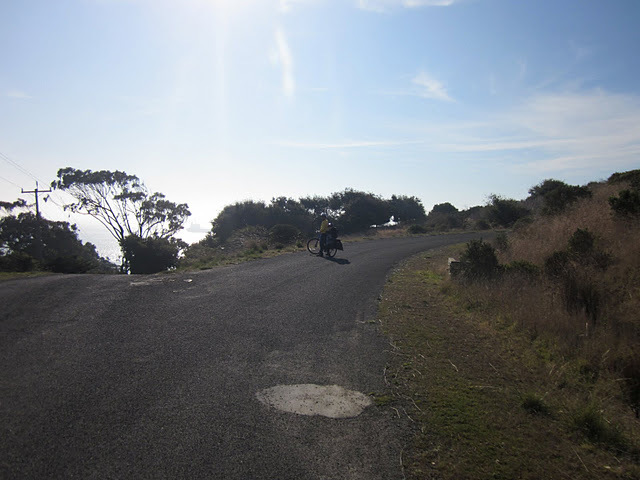 Case in point: on the way up the seriously steep hill to the old Nike missile site, Matt started weaving with the combined load of cargo bike, our son, and our gear, and three-quarters of the way up he had to get off and walk. Since he ended up crosswise in the road, I had to stop and walk as well. When we got to the top we saw a sign telling bicycles that the hill was too steep to ride down, and walking your bicycle was required. No such sign on the uphill side, however. The views on Angel Island are amazing. If our kids had been older they would have appreciated them more. They preferred to stop and look at things closer to the ground and complained that we wouldn’t let them climb on the restricted access crumbling old buildings. We didn’t pack enough food and snacks, underestimating the time the trip would really take, and they were hungry and cold. By the time we got back both kids were exhausted. Our daughter started complimenting random teenagers on their braces. “You have shiny teeth! Where did you get shiny teeth?” and trying to make snow angels on the disgusting ferry carpet. At this point in the preschooler repertoire, the decision to take off underwear and run around shrieking cannot be far behind. Our son got so frustrated with waiting to get off the ferry dock that he punched Matt in the crotch. It was a low moment. With hindsight I’m glad we went, but I wouldn’t go again with the kids for a long, long time. But someone else going to San Francisco, with older kids or no kids at all, would probably like this ride quite a lot. 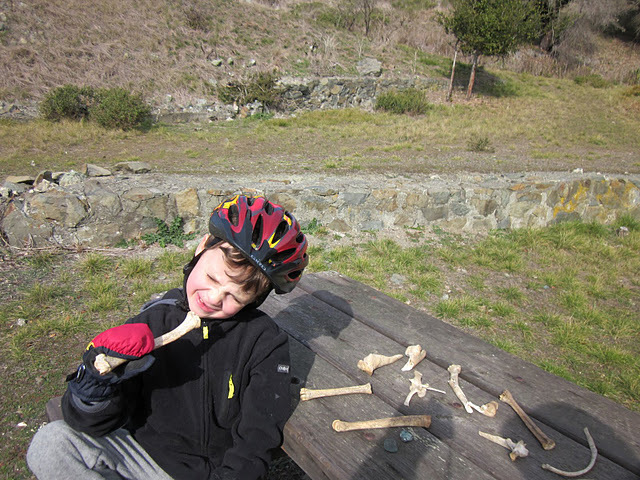 A thoughtful visitor assembles found bones into a skeleton. We try to convince our kids not to destroy it. What I would do again is ride the ferries with them. 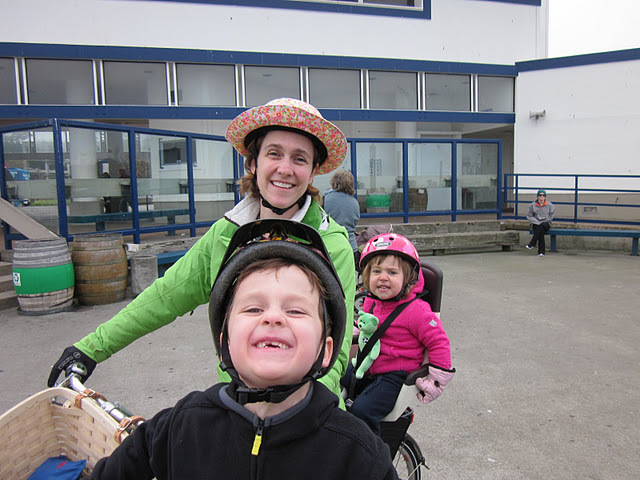 Riding to the docks is entertaining enough to suit them, they loved riding the ferry and looking out the windows, and in a pinch, the kiosk on board is chock full of snack foods in neon packaging. We could have hopped off in Sausalito and ridden home across the Golden Gate Bridge (the western bicycle path will soon be closed until April), laughing all the way.